Neff’s school sweatshirts are the classic, comfortable wardrobe staple you're looking for and the perfect way to show your school spirit! With 100% custom-sewn designs, text and graphics, these customer favorites are a great way to stay warm while cheering on your team or showing your school pride! With the ability to completely customize your schools sweatershirts, you can create a look that's totally unique. But, with our online design templates we offer a few guidelines and templates to get you started! The Momentum Crew Neck School Sweatshirt also includes 1"x1" ribbed cuffs, crew collar and waistband for comfort, while the Momentum Hooded Sweatshirt includes a front, pouch pocket for storage, and a contrasting hood lining and drawstrings. For a more vintage inspired design, take a look at our Retro Sweatshirts. Our Retro Hooded Sweatshirt and Retro Crewneck Sweatshirt both feature bold block lettering across the front chest. Choose your text, text outline and fleece colors. Our Retro II Sweatshirts feature arched lettering across the front chest, and additional text decoration both above and below. With our both our Retro II Hooded Fleece Sweatshirt and our Retro II Crewneck Fleece Sweatshirt you can take your pick of fleece, text and text outline colors! Not only are these school sweatshirts a customer favorite, you can also custom design them online with our new apparel builder tools! Select everything from the text colors, to the mascots, to the logos, to the contrasting hood liners and drawstrings. You can also see a virtual preview of your selections every step of the way. What are you waiting for? Design your school sweatshirts today! 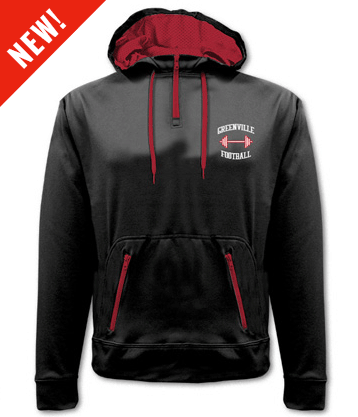 Take a look at our full collection of custom school apparel! *Restrictions apply to designs included in total price.